I already have a great multi mode 2 meter base (A TS-711), a very nice 2 meter mobile (An Azden), several hand-helds and dual bands that operate on 2 meters. So why do I need another 2 meter radio? Well, really I don't. I wanted one. In particular, I wanted this one. I wanted this one because I love commercial gear, and rarely let an opportunity pass me by to get my hands on real professional quality gear - particularly if the price is right. For decades, amateur radio operators have appreciated the value, quality, and capability of surplus government and commercial gear. This has mostly been military surplus gear, usually coming on the market cheap after the end of a war and the subsequent stand down, or sometimes just when an upgrade cycle occurs. It can be sporadic, though, with huge gluts of amazing bargains, interspaced with long periods of high prices. Generally such gear is far better than anything you will see at your local radio store. Military gear can be quirky though. Often it operates at strange, non standard voltages, has odd frequency ranges or offsets, and may use non standard connectors, batteries, and accessories. It can also be quite large and heavy. As if this weren't bad enough, some of the gear is not salable in its fully functional form, due to security concerns, and may be partially deactivated. Tuning increments can also be odd. It can sometimes be expensive to modify such gear to work with standard power supplies, on regular frequencies, and with easily available accessories. More convenient is commercial and police gear. This has many of the advantages of military gear; but usually is not as difficult to put to use. Lately, there has been a wealth of such equipment, as commercial and government operators scramble to adhere to the new narrow banding requirements imposed upon them by the FCC. This is mostly government, police, and maritime operators, though it might also be the fleet dispatcher for a cab company, or even the service dispatcher for a local plumbing company. I already have some commercial gear, from Kenwood; but really did want to get my hands on some police gear. At a recent ham swapfest, I got my chance. I picked up a pair of Midland Syn-Tech XTR commercial radios, from a local ham and radio tech. One for VHF, and one for UHF (the UHF radio has a page of its own). These were produced in the late eighties/early nineties, and are wonderful radios; but somehow never took off with ham operators, the way the Motorola and GE radios have. Like many other police and public service radios, these are modular units which have a control head separate from the radio itself. As can be seen in the photo to the left, the control head is quite small and simple. The people who typically use these radios are not doing this as a hobby. To them, these radios are tools. Most neither know nor care what frequencies, modes, offsets and power output their radios have. What they do need is a radio with absolute dependability, that will get them back up, or help without complication when they need it. It must work in all weather, under all conditions, and sometimes with less than ideal antennas and power sources. This is a reprogrammed commercial PS band radio, set up to work on the 2 meter ham band. As always, it is wonderful to use commercial gear. The quality, specs, and ease of use are like nothing you ever see in consumer grade gear. The most common place to find radios like this is in government service. usually police or other Public Safety (PS) users have these. The government does not care much about saving money, so like military equipment this kind of gear is built for the long haul, and is not cheap when new. For all the sophistication behind them, these radios are about as simple as you can get. Volume, Squelch, and channel selector are the main controls, with a scan and monitor button on some versions. If your desire is for local dependable communication, you really can’t do much better than these. Shall withstand for five minutes, all VSWR around Smith Chart of 20:1 without failure or damage. Shall not exceed spurious emission requirements when operated into a mismatch load of 5:1 VSWR at any point on the Smith Chart. I dare anyone to try that with any modern consumer grade radio, and see how long it lasts. Transmitting into a 20:1 SWR for five minutes with no damage? This should be a pretty good hint that the world of commercial, PS and government gear is a pretty heady place, compared to the lower realms of consumer quality gear. Yet for all their advantages, they do have some drawbacks for amateur use. These are FM only radios, which is great for repeaters; but not so good for satellites and certain other uses. There is no CW, AM, or SSB on these units. On the other hand, the majority of mobile radios in this band are primarily used to access repeaters, and are thus FM only. They biggest disadvantage of these radios, from the standpoint of amateur use, is the limited number of channels. This particular unit is set up for 99, and there is an aftermarket kit which will provide up to 320, though I have no idea how so many channels would appear on a two digit display. Originally, this model offered 22 channels, and versions with 32 were available, as well as 80 channel kits. These are channelized radios, and do not continuously tune frequencies. They tune to whatever frequency the synthesizer is programmed to create for a given channel. This means only having access to frequencies for which the unit is programmed. It also means viewing a channel number instead of seeing a frequency read out. While this is great for the intended market – PS and commercial users who are not radio people and do not wish to be distracted by such things, it is a bit limiting to a ham operator. Or is it? There are perhaps six repeaters in my area that get enough use to be worth using, with another half dozen simplex frequencies that get regular use. twenty or thirty channels is more than enough for the needs fo most radio operators. Really, 99 channels is overkill. Still, for those who want the whole band, lets do the math. A 4 MHz wide band, such as 2 meters, at 25KHz spacing means 160 channels at that spacing would use the whole band. 320 channels would work the whole band at the new 12.5 KHz narrow banding. This particular radio has 99. So you might figure there are 61 frequencies that would not be available without reprogramming. A look at the 2 meter band plan shows this to be wrong. According to the two meter band plan, the first 600 KHz is reserved for CW, SSB, and satellite. Another 200 KHz just below 146 MHz is also reserved for satellite. The missing 800 KHz equates to 32 channels. So technically, there are only 29 frequencies that would not be available to this radio, without reprogramming, with a 99 channel limit. 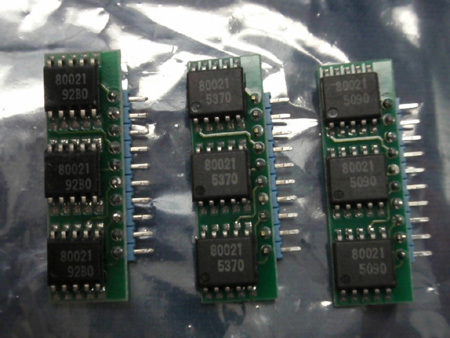 If this is a problem, for about $50 you can pick up a 320 channel eprom. This will actually give you more channels than can be used on the band. This version of the Syn-Tech radio breaks down into four components, shown in the photo above. There is the transceiver unit (sometimes known as the remote), the control head, the speaker, and the microphone. The control head connects to the transceiver via a 34 pin ribbon cable very similar to an old floppy drive cable. The cable itself is about twenty feet long, giving lots of mounting flexibility. I will probably run mine under the carpets from the trunk, or from under the rear seats, depending upon where I decide to mount the transceiver unit. I have some old floppy ribbon cables around, and have tested them. I am happy to report that a standard 34 pin floppy cable will work as a connector for this radio (for the XTR version only - not for the Syn-Tech II). On the newer units, this has been replaced by a 37 pin cable. The photo to the right shows the ribbon cable connected to the back of the control head, along with a Molex connector for the speaker. There is no power connection required to the control head. All power comes through the ribbon cable from the transceiver unit. If you decide to purchase one of these radios, you will need all four components, as well as the connecting cables to have a working radio. There is another version of the radio that is the same functionally and electronically, but is housed in a single enclosure. The control head has a two digit display, in traditional LED red. It also has the control knobs, scanning buttons, and indicator lights. There are no controls at all on the transceiver unit. The control head also has the six pin connector for the microphone. The unit is compact enough, and ideal for a small car, a console, or under dash mounting. The microphone has a lit keypad with full DTMF functionality. It also has buttons to change channels. An on off switch on the microphone activates the keypad, and the green backlighting. The size of the head and its remote location from the main unit makes it a pretty handy choice for marine operation, and even for a base unit, with the transceiver up near the antenna or out of the way. It would also be a very handy two meter radio mount in the fairing of a motorcycle, with the large transceiver unit safely tucked away. Though this would make a great base or repeater (when used in pairs), it really shines as a mobile. I can personally vouch for the fact that, though the control head is quite light, the transceiver unit is heavy, and built like a tank. It is also quite well sealed. So what do you suppose happens if the transceiver is dropped, gets wet, or gets banged around a bit? What happens if you step on it, or something falls on it? The answer to that question is easy. Nothing. The case is cast metal, not sheet metal, and does have cooling fins. It also has a slide mount, and is set up to be secured with a lock. There is even a carrying handle. There are no controls of any kind on the main transceiver unit not even an on off switch. Everything is done from the control head. This would appear to make this radio a natural for conversion to computer control. Internally, these units are pretty easy to repair, modify, and enhance. Four screws hold the rubber sealed cover on, and allow easy access to the main board. Once inside, the build quality of the unit is obvious. I wish I could say these were American made; but most electronics manufacturing in this country went away after the seventies. These units were built in Japan by Hitachi. The copyright dates on the boards are 1989, and 1990. So the units were probably made up until about twenty years ago or so. What this means is lots of gear available in good shape, with a large base of techs, and a considerable amount of service manuals, repair guides, and literature on line. 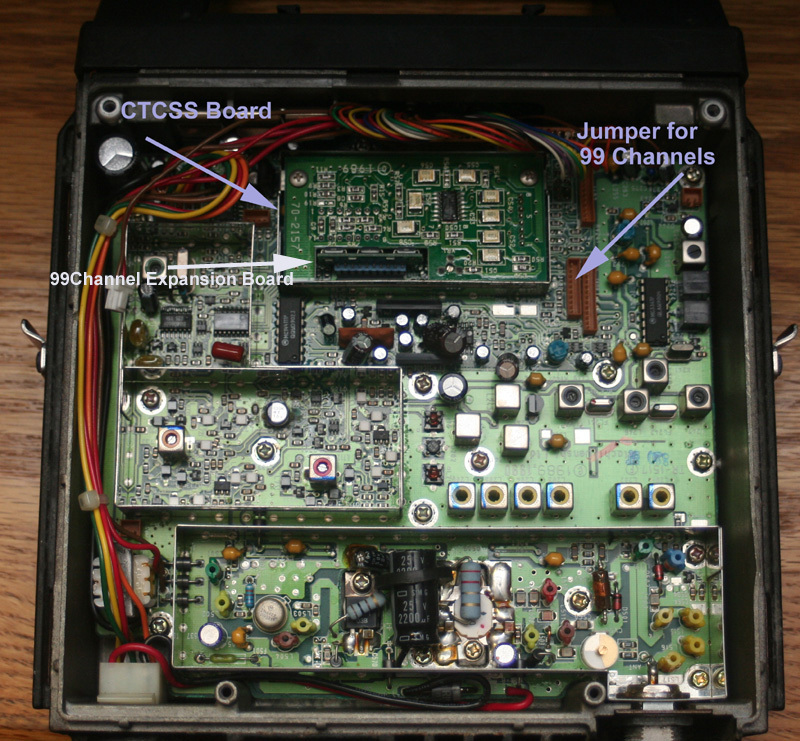 The interior view shows the locations of the CTCSS (tone) board, and the 99 channel upgrade, which is simply a set of three memory chips on a board. Directly under the CTCSS board, but not visible in the photo, is the main processor chip. If you are considering the purchase of one of these radios, and have access to the unit before buying, you may want to consider checking to verify these two upgrades are present. In particular, you will want the tone board. A VHF FM radio without tone capability is practically useless these days, as almost no repeaters exist which do not require a tone. It is possible to find a tone board out on the web; but due to the age of the radios, parts availability is a matter of luck. The 99 channel upgrade is nice; but not as necessary as tones. Note that in this particular radio, the 99 channel expansion is installed; but the jumper to activate it is not in place. I presently have 33 channels programmed into the unit, and even a few of these are receive only, for weather. For illustration purposes, the photo above has the shielding covers removed, to better show all the components. What you will actually find, upon opening the case, is what is shown in the photo to the right. This is the unit with all of the shielded compartments in place, and is another indication of build quality. Shielded radios are far less susceptible to birdies and other sorts of interference. A few adjustment points are left open in the shielding, so that the radio can be tuned with the shields in place. This type of construction is far more common in commercial gear than in even the best amateur gear. In CB and commercial gear, it is non-existent. I have some pretty expensive Kenwood gear; but see no such shielding in any of those radios. The relatively new and expensive Kenwood TS-2000 is notorious for various birdies. Some shielded compartments, particularly around the processor and the PA, would likely put an end to these. From a production point of view, the reason all radios are not shielded is cost. It is not cheap to build little compartments around the various sections of a radio, and then set removable caps into place. This is labor intensive work, and there is no way to easily automate such a process. Designed for the heaviest use in the harshest environments, in amateur service, these radios will last forever. This particular unit is an XTR version, which means it can be programmed through a computer, with an appropriate cable/adapter and software. While all Syn-Tech radios can be programmed, earlier versions required an eprom programmer. XTR and subsequent versions can be easily programmed through a connection to a computer. The computer programmable versions can be recognized by a small rubber plug on top of the unit. Pulling the plug up reveals a connector for the programming cable. I would probably not seriously consider purchasing a channelized radio that can not be programmed in this way. The cable to adapt the ten pin connector to a computer's COM port is not simply a physical adapter. Some circuitry is required to change TTL levels to those of a standard RS-232C port. There are a couple ways to do this, either with a programmer adapter or a cable with a built in level converter; but either way it will cost around $40 - $50. Cables are available from some of the people in my links section. Though you can build one yourself, and I have included a schematic below, frankly it's not worth the trouble You won't save much money, you will spend a lot of time, and your cable may not work properly. My first purchase of this radio included programming by a local ham; but as I became more familiar with the capabilities of the radios, and of the frequency ranges of the various models, I was moved to purchase a cable. In addition to the cable, software is required, and is widely available. For the XTR units, this is DOS or Windows software. I prefer RadioPro, which is the Windows version. I have the software and have the cable; but have only done a bit of programming. I will update these pages when I have gained a bit more practice. Most of the Syn-Tech radios on the market today are of the XTR type, or perhaps the Syn-Tech II. The radios were made in such quantities that there is little reason to go with the older style. The originals, in addition to being much more difficult (and thus expensive) to program, had fewer channels. Some versions had as few as eight. Various models of these radios will cover 10 meter, 6 meter, 2 meter, VHF Marine, 70 cm, and GMRS/FRS. There is also one vendor of which I am aware, that offers an adapter to allow direct connection between a computer RS232C, and the main units 34 pin connector. This would allow direct computer control of the radio. With these radios being available on so many bands, and with up to 100 watts of power, this offers some interesting possibilities, particularly at the low prices now being asked. I am considering using one of my older obsolete computers, and adding a few more COM ports to allow connection of four of these radios operating on different bands. It may even be possible to set up a pair using a computer as a repeater controller. Lots of mods on these radios - too many. That is probably one of the reasons for their popularity. As police/commercial radios, these were modular in construction, and could be ordered to suit the needs of the operator. They were available with anywhere from 8 to 99 channels, and there is at least one aftermarket company that produces an add on module that will bring the channel count up to 320. Encryption and trunking boards were available, as well as repeater (store and retransmit) and tone options. A tone burst board (now largely obsolete in the U.S.) was available, as well as a DTMF decoder. The most common and necessary option is the CTCSS tone board. An uninstalled CTCSS board is shown in the photo to the left. The same board can be seen in the photo above of the inside of the radio; but the installed board is face down. These can be somewhat difficult to find; but the good news is that most of the radios you will find already have these installed. The notch visible at the bottom of the board, is to allow insertion of the 99 channel upgrade on the main board of the radio. Once the tone board is installed, tones are selected during programming. This board is capable of decoding on receive as well as encoding on transmit. The Midland 70-2180, 99 channel upgrade is nothing more than a set of memory chips to enhance the on board memory, and hold the additional channel information. These are very similar to computer memory modules, and can be user installed by snapping them in. They install under one of the RF shields near the CPU of the radio main board. A notch in the CTCSS board allows both options to be installed. A photo of the memory modules is shown to the right. Three are in the photo; but only one is installed on the radio. This particular radio has both of these options installed, as well as the scan option. The scan option is nothing more than a bezel with a scan button and a new trim. It allows scanning of the entire range of channels, or of specific banks set during programming. Software, circuitry, and memory for this is already present on the motherboard. Only the button is added in the upgrade. This offers some interesting possibilities to those attempting top computer control these units. Other interesting options are a weatherproofing kit, a 2.5 ppm frequency stability kit, and an assortment of speaker and microphone options. All of these radios are available as all in one units, or as remote trunk mount units. Various mounting and cabling options are also offered. Because these are programmable radios, any frequency within the programming range may be selected, though the range can affect transmitter power. Frequencies within 10 MHz of a user selected central frequency will have a transmitter power of 40 watts. Frequencies within 24MHz will have 30 watts of transmitter power. The manual indicates two frequency ranges for this particular model - 136MHz - 160 MHz (A), and 150 MHz - 174 MHz (B). You might notice that the A range is ideal for 2 meter, and the B range is ideal for VHF marine. These bandwidths can be extended through the programming and will program out of range. The VCO usually requires adjustment when the radio is programmed out of the factory frequency range. VCO unlock is indicated by E3 blinking on the display and an alert tone. If you can not find the 16' - 20' 34 pin cable made for this radio, you can use a standard floppy cable instead, though please note that this only works for the XTR version of the radio. Floppy cables can be handy because they are relatively cheap, since no one really uses floppy drives any more. They are also short, typically only a few feet. This can be handy for base use, if you do not want to deal with stowing the extra length of cable. Floppy cables generally cost a dollar or two. Syn-Tech cables in standard lengths are around eighteen dollars, though you can get a shorter cable for around eight dollars. For those not familiar with them, a floppy cable will have a single connector at one end, and a pair of connectors close together at the other. On the end with the two connectors, one of those connectors will have a twist in a portion of the ribbon cable. For use with this radio, you will want to plug the single connector end into the base unit, and the non twisted connector on the other end into the control head. Make certain both ends of the cable are securely connected, and lock them in. The cable ends are keyed, and by good luck, they match the keying of the radios. On my personal; radio, when used as a base, I have cut the second connector off the dual connector end. This makes for a more manageable install, and makes it impossible for the wrong end to be connected. These commercial radios can sometimes be confusing to buy when found on ebay and other such places. You will see control heads, main units, and all kinds of other things with dire warnings that this is a part of a functional radio, but will not function by itself. Advertisers will then talk about low band, high band and other such things, making it even more confusing. The first thing you probably want to do is figure out which model is useful on the frequencies you want. A guide to the frequency ranges of different models can be found here. You get to the point where you do not know what you are buying, if you have everything, and if it will all work together. Many people selling this gear don't know what they are doing, or in some cases intentionally break units up and sell components separately to make more money. I have seen radios that will work (or can be realigned to work) on 10 meter, 6 meter, 2 meter, GMRS, 70 cm, and VHF marine. I am trying to verify rumors that these are also programmable for 12 meter, and 900Mhz. If used as a base, you will need a 13.8 v power supply. You will also need a programming cable and programming software, unless you purchase the unit from a tech or shop that will program it for you. I purchased my radio for $35 from a local ham operator and radio tech who programmed it for me with all the local repeaters, and a few of the more popular simplex frequencies. I consider this to be a great bargain. You may do better or worse on the net or at local swap fests. Installation is a bit more complicated than your basic all in one unit; but also offers some flexibility. My remote unit is installed under the passenger seat, with a coax running to an antenna mounted by the trunk, and the control head mounted in an opening in the dash. Installation only took a couple hours, and could have been done faster; but it took me a while to decide not to mount the remote in the trunk, which is traditionally where they are mounted. The control head is small enough that I can actually mount two of them (2 meter and 70 cm) side by side in the dash opening which originally held my old CB radio. I will update with photos of the install when I have time. Schematics are available on some of the sites listed below, and offer the potential of creating a custom interface, feeding off the ribbon cable to the control head, for computer control of the radio. I am wondering about the possibilities fo multiple radios running off the same computer, permitting multi band operation, or perhaps even configuring as a repeater. It also gives potential for unlimited scanning memories and banks, as well as digital recording and logging. Once you get one (or more) of these things into the computer, it's just a matter of the imagination of the programmer. Similar offerings from Motorola and G.E. are probably just as good; but due to the popularity of these brands, are probably more expensive. Midland does have a number of newer commercial radios out there, offering more channels, and more digital features; but they are also more expensive. A newer Titan style Midland radio is about four times the cost of the Syn-Tech, and to my mind does not offer sufficient additional features to justify the additional cost, to most amateur operators. These were somewhat popular radios with commercial users, and are finding a new lease on life with ham operators. There are a number of links and resources on the web.